The secrets of the brewery are its water and its yeast. Yeast is treasured in the abbey and propagated by them. Brewing yeast is composed of fungi (Saccharomyces cerevisiae) that are very beneficial to the human body and allowing the famous fermentations. This gives a beer that is rich in vitamin B and minerals and is a powerful antioxidant. Their production process lasts 6 to 8 weeks, in full respect of the original tradition. 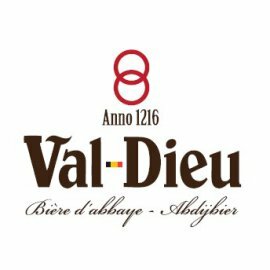 That is how they get this high alcohol content (6% for the Blond beer, 8% for the Brown one, 9% for the Triple) and these complex aromas that characterize the Val-Dieu beers. The water comes from the Gileppe dam. This region has many water springs giving a water of excellent quality. Some of those local springs are known worldwide such as Spa, Bru and Chaudfontaine, all located within 20-30 kilometers from Val-Dieu.